I mentioned in my last post that there is a larger message than “investing is really tough after you retire”. It’s about the amount of risk you can handle after retiring. It will be much harder to recover from steep portfolio losses after you simultaneously begin spending your savings and foregoing new savings contribution — and your employer’s match, if you get one. But it’s a different game after you retire. Your portfolio will recover much more slowly. Your retirement savings account is like a rain barrel. Rains (stock market gains) fill the barrel. While you’re working, you dump in a little more water from the faucet (savings contributions) on a regular basis. You never take any out. The barrel fills relatively quickly. After retiring, you not only stop dumping in regular additional water, you begin drinking the water daily (spending your savings). It’s a different equation. The financial services industry will tell you that stocks get safer the longer you hold them. They don’t. To quote Zvi Bodie, stocks are risky no matter how long you hold them. And the longer you invest, the larger your portfolio becomes and the more money you lose when the market drops say, 15%. They say that if you simply stay in the market long enough, your portfolio will eventually recover its losses. That part is probably true, so long as the U.S. economy continues to grow and you gloss over “long enough”. 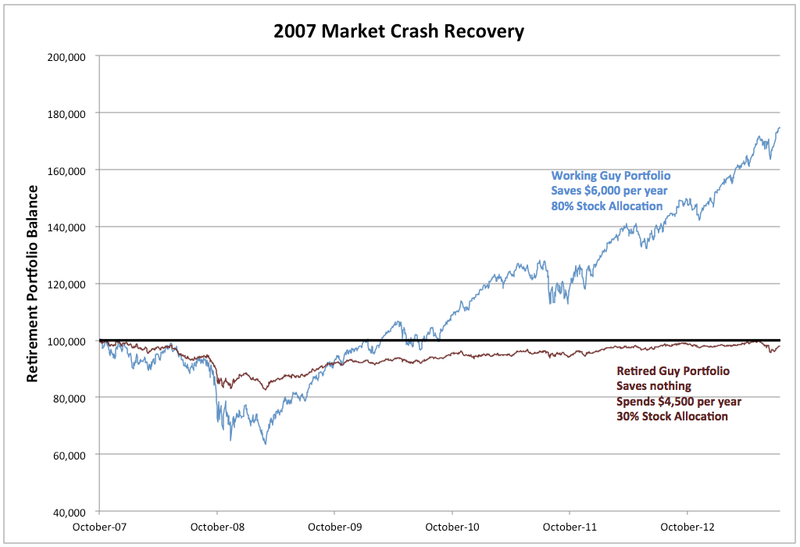 The 2007 crash took about 5 years for the S&P 500 to correct, but that probably isn’t the same as your own portfolio. Most investors don’t see anywhere near market index returns or invest solely in an S&P 500 index fund, so your individual recovery time may be much longer. Also, working investors are probably adding new savings while retired investors are probably spending some of their savings. Let’s look at Working Guy and Retired Guy and how each might have fared after 2007. When the S&P 500 peaked in October 2007, Working Guy and Retired Guy both had retirement savings portfolios worth $100,000. Working Guy saved $4,000 a year in a 401(k) plan and never had to spend any savings before retirement. His paycheck covered the bills. His employer contributed a matching $2,000 each year. 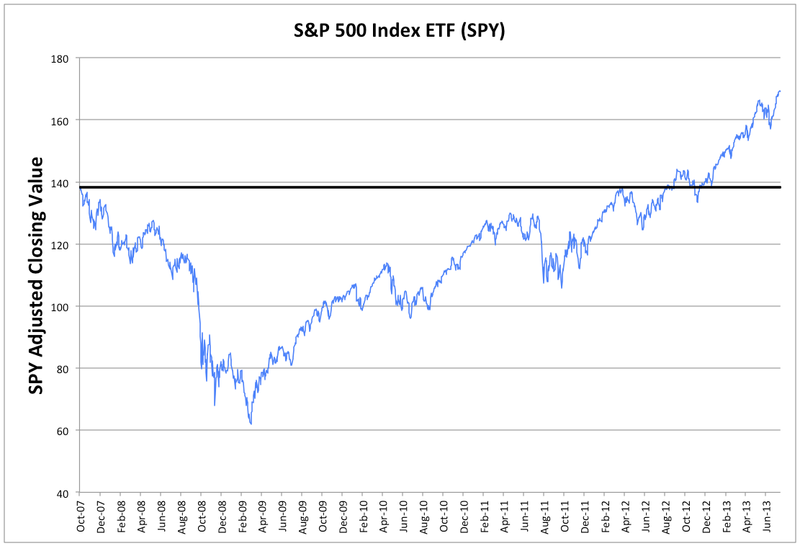 He held 80% of his portfolio in an S&P 500 index fund (SPY) and 20% in Vanguard Total Bond Market fund (VBMFX). Retired Guy no longer contributed to retirement savings and he had decided to spend 4.5% of his initial portfolio value each year, or $4,500. Retired Guy knew he should take less market risk after he retired, so he held only 20% of his portfolio in the same stock index fund as Working Guy and the remainder in the same Vanguard Total Bond Market fund. In a year when the market breaks even, Working Guy’s portfolio increases $6,000 and Retired Guy’s portfolio shrinks $4,500. That $10,500 difference every year is a lot — 10.5% of a $100,000 portfolio. The following chart from Yahoo! 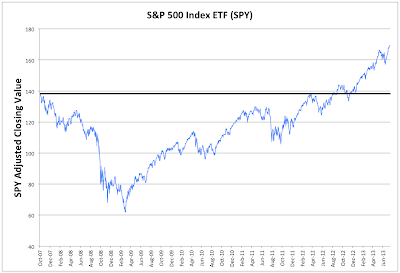 Finance data shows what happened to the S&P 500 index fund SPY. After peaking in October 2007, the index fell 54% by March 2009. It recovered its October 2007 peak value in August 2012, 4 years and 10 months after it peaked. An investor who stayed fully invested in an S&P 500 index fund would have recovered his portfolio value in that 58 months if he neither continued to save nor spend from his savings. But Working Guy saves $6,000 a year while Retired Guy spends $4,500. As you can see in the next chart, Retired Guy’s 30% stock portfolio fell 17% and Working Guy’s portfolio fell 37% before heading back upward. Working Guy’s losses would have been even greater because of his larger stock allocation, but Working Guy and his employer shoveled $9,000 of new cash into the teeth of a gut-wrenching, money-shredding, 17-month decline while Retired Guy did not. Not only did Retired Guy not put more money into his portfolio, he spent $6,750. Working Guy’s portfolio then moved upward and recovered in January 2010, 27 months after the market’s peak and 31 months sooner than the S&P 500 index. In August 2012, media pundits were saying, “If you had only stayed in the market, you’d have recovered your losses by now.” But that wasn’t true for either Guy, was it? Working Guy’s portfolio had actually recovered 31 months earlier and Retired Guy’s 20% stock portfolio wouldn’t recover for 9 more months. In fact, had Retired Guy held more than 30% of his portfolio in stocks, his portfolio still hasn’t recovered after nearly 6 years. If the bull market continues, a “Retired Guy” 40% portfolio will probably recover in a year or so, taking twice as long as Working Guy’s. If the bull market continues. On the other hand, the nature of retirement portfolios is that they will be spent down over the retiree’s remaining life and it’s quite likely that many retirees and near-retirees who endured the 2007-2009 crash will never recover their October 2007 portfolio value. If they had it to do over, they would have held less stock. 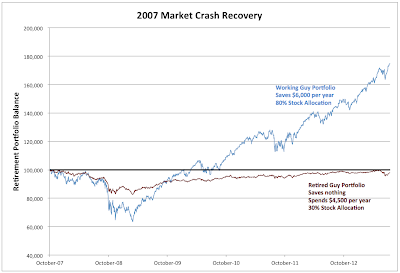 My point in all this is that it is much harder to recover from a severe market decline after you retire than it is before. See that blue line on the chart? That ain’t you, anymore. That line is headed upward, probably, until retirement. Yours is probably headed the other way. When you get older, everything heals more slowly. Even your portfolio. You have to think hard about not getting hurt badly in the first place. In the decade before retirement, when we can make “catch-up contributions” to retirement savings, we become really spoiled by fast recoveries from crashes. We become confused about how much of our “investment skill” is actually just saving more. When the super-saving stops and the drawing down of savings begins, our sleds hit that patch of dry pavement at the bottom of the hill. Our momentum dies quickly and then we have to carry the sled back up that hill. The sled ride downhill is a lot more fun. Note: I must apologize for a spreadsheet error in the initial draft of this post that over-valued bond portfolios for Retired Guy. The result was that the 63-month recovery period reported for Retired Guy's 40% portfolio should have been a 67-month recovery for a 30% portfolio. Correcting this mistake actually strengthens the arguments. Only a 30% Retired Guy portfolio has recovered its October 2007 value as of this writing, so the 40% portfolio used was replaced with the 30% portfolio. The challenges of financing retirement change dramatically on the day you retire. You may imagine that retiring with adequate savings one day will feel like winning. But you’re really just taking a lead into the locker room at halftime. In reality, the game will have changed and the challenges will be even greater in many ways when you return to the court for the second half. The goal shifts from accumulating a pile of money to making a pile of money last. We refer to the period before retirement as the accumulation phase because our goal is to accumulate enough wealth to maintain our pre-retirement standard of living after we retire and the paychecks end. We call the period after retiring the decumulation, or spending phase because our objective then becomes stretching out our wealth to pay our bills for the rest of our lives. · We have jobs and paychecks that cover our living expenses. The paychecks arrive, for the most part, during both bull and bear markets. A temporary loss in the stock market may not affect our spending at all. · We hopefully have some money left over to save in a retirement account and to increase its value. · We can take some risk with our investments, because we don’t need that money to live on (yet) and that generally means we can earn a higher return. · Our investment returns apply to a growing base of capital as our wealth grows. When we are 30, we might earn 8% a year on a $20,000 portfolio, or $1,600. When we are 60, we might earn that same 8% on a portfolio of $500,000, yielding $40,000. · Dollar Cost Averaging (investing the same amount of money every year) allows us to buy stocks at lower prices over time. · We could lose our entire retirement savings portfolio and possibly have time to rebuild it before we retire. · We may have health insurance paid for by our employer. · No more paychecks. Expenses are paid from our savings. · No more savings contributions. Our portfolio increases only when our investments do well. · We need to reduce investment risk, because we no longer have paychecks to bail us out during bear markets. That generally means a lower return on our investments. We might expect a 6% portfolio return instead of 8%, for example. · Our investment returns apply to a shrinking base of capital as our portfolio is being depleted. Even if we earned 8% every year, it would return 8% of a (probably) smaller number every year. · Dollar Cost Averaging works in reverse. We spend roughly the same amount every year so we sell more stocks at lower prices and fewer stocks at higher prices. · We pay for health insurance out of our own pockets. It is very expensive. · Since we are no longer working, when the retirement savings is gone, it’s gone. · On the positive side, we no longer pay FICA taxes and no longer need to save for retirement. If accumulation is like sailing a boat with fair winds and a following sea, as they say, with plenty of fuel for the engine if the winds die down, then investing in the spending phase is like pounding into the current with strong headwinds in a boat that’s growing heavier as it takes on water and has spent its fuel reserves. During the accumulation phase, you’re contributing to savings and not spending from savings. In the spending phase, you’re doing the reverse. And probably earning a lower return to boot. A retiree spending 4% of her savings each year adjusted for inflation has to earn 4% plus the rate of inflation plus the cost of taxes and commissions on her investments just for her portfolio to break even that year. 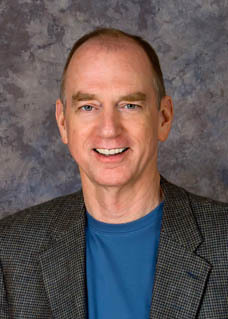 This younger John contributes $4,000 at the first of the year to his 401(k) account. Before retirement, his portfolio increases to $104,854 plus $4,000 of new savings for a new value of $108,854. Because John’s portfolio is growing, a 4.85% inflation-adjusted return next year will provide an additional $5,284 of real value (4.85% of $108,854). If this scenario occurs after retirement, the older John still earns $4,850 in the market, but his portfolio shrinks a bit from spending $4,000. He is no longer contributing to his 401(k), so his portfolio value ends the year at $100,854. Because older John’s portfolio is shrinking in the spending phase, an 8% return next year with 3% annual inflation will provide only $4,896 of real value, 7.4% less than younger John’s portfolio would earn. There is a larger message here than “investing is really tough after you retire” that I will address in my next post. It’s about the amount of risk you can actually handle after you retire, because it will be much harder to recover from large portfolio losses. I used a sailboat analogy to describe the difference between accumulation and spending phase economics, but having just finished my eighth year of retirement and surviving the 2008 market crash, the real estate crash, seventeen grand a year for family health insurance, two kids still in college and a third in med school, I can think of a more visceral analogy for how investment feels after you retire. Remember when you were a kid sledding on a hilly street of packed snow and near the bottom, at top speed, your runners ran into a patch of dry pavement? I recently received an interesting e-mail from a friend nearing retirement. He told me that he believed his portfolio had recently reached seven figures and wondered if I thought he should “cash out” soon. Good answers, as the game show hosts like to say, but not what we were looking for. If you believe “Safe Withdrawal Rate” (SWR) advocates, then you probably assume you might be able to spend about 4-½% of your retirement nest egg each year and have a 94% probability of your savings lasting 30 years or more1. I don’t believe this for an instant, mind you. The so-called SWR analysis is fatally flawed, but I think it can serve as a comparison of the alternatives. Using the same data, the analysis shows that if you hold your retirement savings in money market accounts, you have only a 31% chance of your money lasting 30 years or more with a 4-½% annual spending rate. I have no confidence that a retiree today could invest in a 60/40 stock portfolio, spend 4-½% annually and remain solvent for thirty years, but I might be convinced that socking savings away in a money market account would be roughly three times worse. SWR believers would say my friend could lower his spending rate to about 2.8% a year and get close to that 94% survivability rate. With a million dollar portfolio then, my friend could spend $45,000 a year if he stays in stocks, but only $28,000 a year if he “cashes out”. Of course, this is in addition to the income he and his wife will receive from Social Security benefits, so either way they’re better off than 95% of the retiring U.S. workforce in 2013. Another alternative would be for my friend to sell his portfolio and buy a lifetime fixed annuity from an insurance company, but the last time I looked they were only paying around 3.5% annually for an inflation-protected annuity. If he were worried about market risk, that might be a reasonable thing to do, but he’d still have to worry about the financial health of the insurer. Furthermore, the sweet spot for annuities is around age 70, so he might be better off staying in stocks for a few more years until he can get a better deal. Maybe interest rates will rise by then, helping even more. So, you can’t just “cash out” your stock portfolio and declare victory on the day you retire. You may have made it through the accumulation phase with enough savings to maintain your standard of living in retirement, but in many ways the spending phase is tougher. You have to make that portfolio last for the rest of your life. You might be able to do that with a portfolio of stocks and bonds, or by purchasing a lifetime annuity, but it will be nearly impossible to achieve with cash alone. While “cashing out” your portfolio when you retire is probably a poor strategy, reducing your risk is not. A bear market just before or just after retirement can destroy your retirement plans, as many retirees learned in the 2007-2008 stock market and real estate crash. That means lowering your stock allocation to somewhere around 40% to 50%, in my opinion, and that’s probably what my friend should do, if he hasn't already. According to William Bernstein's The Intelligent Asset Allocator, an 80% stock portfolio would probably suffer a decline of no more than 35% in a bad bear market, while a 40% stock portfolio should lose no more than 15%. I typically cover topics that might help retirees who haven’t saved enough and this one obviously applies to people with significant retirement savings. The transition period just before and after retirement is very interesting for those with large portfolios, though, so I will digress a bit over my next few blogs to discuss that topic. My point today, however, is that your investment challenges don’t end the day you retire. In fact, they become more difficult. Not only do you no longer have income from work, you're spending down your portfolio and you may need to take less risk with your investments, which more often than not means lower returns. You'll need more help solving that problem than you're going to get from cash. 1Safe Withdrawal Rate calculations are based on the spreadsheet provided by The Retire Early Homepage.